Your office relies on your laser printer for fast, quality printing. Sandia Office Supply has everything you need to keep your laser printer running—from toner cartridges and paper to maintenance kits. For businesses on a tighter office supply budget, we also carry quality remanufactured laser printer toner cartridges by Elite Image. To find other ways to make your office supply spending more cost-efficient, ask your designated customer service representative. Proper maintenance can sustain your laser printer’s performance and extend its lifespan. Sandia Office Supply carries laser printer maintenance kits, and if you notice print quality deteriorating, our manufacturer-made replacement components (e.g., fusers and developers) may be all you need. In addition to our wide selection of laser printer and inkjet printer supplies, Sandia Office Supply also carries janitorial supplies, breakroom provisions and other office supply items. Explore our inventory of over 30,000 items and easily order exactly what you need with our barcode catalog and scanner or online system. We offer free next-day shipping across the country with no minimum order. To experience all the benefits of a local Albuquerque-based office supply store with national reach, open an account with Sandia Office Supply today! 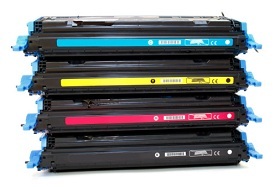 Call 505-341-4900 to order your laser printer toner cartridges from Sandia Office Supply of New Mexico today!